What is a Turnkey Budget? Most log and timber homeowners dream about their new home for years. Whether the home is a place for the family to unwind or a place to get back to nature, a custom designed log & timber home is a reward for a lifetime of accomplishment. But like everything else in life, cost is an inevitable consideration. The best way to avoid surprise and disappointment over the cost of your log & timber home is to establish a realistic turnkey budget at the outset of the conceptual design process. Turnkey refers to the total cost to build your home, from foundation to turning the key in the front door. It does not include the cost of land or land improvements, such as adding a septic system or constructing a road. Over the last 25 years, M.T.N Design and PrecisionCraft have designed and produced over 2,000 log & timber homes. During this time, they have learned that calculating an estimated turnkey budget is the critical first step in the custom home design process. Establishing a budget at the beginning of the process allows the budget to direct your home’s design. This includes the type and amount of your log or timber materials ensuring it fits within your budget. geographic location where you are building. The impact of square footage in the home is fairly straightforward. The bigger the house, the more building material is needed to build the house. However, complexity of a home’s design, and how it impacts cost, is not understood so easily. Increasing the number corners, roof ridge lines, and roof valleys lengthens the construction time. The level of finishes that you choose also has a dramatic impact on overall cost. Granite counter tops, jacuzzi tubs, wide plank flooring, etc. are beautiful amenities, but are more expensive than Formica counters, fiberglass tubs, and carpet. Lastly, the location of your land can be a huge factor in turnkey costs. Labor and some materials are more expensive in some parts of the country than others. The difference between building the same home in State A versus State B could be thousands of dollars. If you plan to build your home in a state other than where you live now, make sure to understand what other custom home building projects are actually costing. 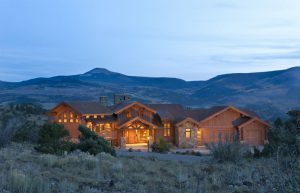 Learn more about the factors that impact the cost of log homes. What Should I Know About Financing Your Log Home? What is an Hybrid Home? How Long Until My Log Home is Built? © Copyright PFB Custom Homes Group, LLC. All Rights Reserved. Unauthorized Use Prohibited.